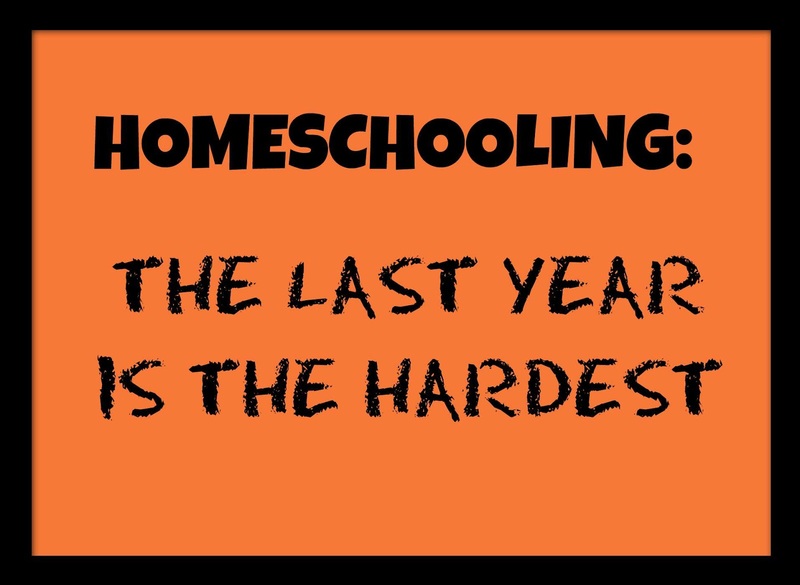 Homeschooling has its rewards, but it can be hard. Some years are harder than others. If this is your first year, you may think this one is the hardest because you are figuring out how to schedule your day and make lesson plans; figuring out how to homeschool. If you are homeschooling with an infant or toddler, you may think this adjustment is your hardest year. While that scenario does take some juggling, it's not impossible and not your hardest year. Maybe your student just started high school and you feel unqualified to teach high school, so surely, this must be your hardest year. 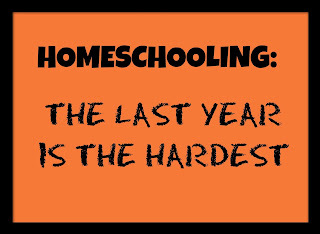 After 24 years of homeschooling, I have discovered that the hardest year of homeschooling is the last year. How can that be, you wonder? Let me tell you why the other scenarios posed above, while they may be hard, are not the hardest. The first year of homeschooling is accompanied by excitement and maybe a little nervousness. It is fun to choose curriculum and make plans and schedules. Some days may be difficult, but you get to see your child learn many new things and it is wonderful. I always (yes always), for the first 12 years of homeschooling had an infant/toddler and often was pregnant, too. So yes, I know that can be hard, but you get used to it and plan your schedule to make it work. It is just part of being a family. I was never afraid of teaching high school. Yes, there were hard days when maybe my student didn't understand something and I didn't either, but we figured it out or found outside help. Just having teenagers in the house can be hard sometimes, but it is not the hardest year of homeschooling. What makes the last year the hardest? I am getting the full picture of what life will be like soon. My youngest is rarely home since all her classes are dual credit at the community college this year. Maybe this is a bit of early 'empty nest syndrome', but I find myself a bit aimless. After years of lesson planning and schedule making, I find that I am not in the habit of making a schedule for one - me. I'm not sure I know how to do this. So, if you have missed the regularity of my posts, this is why. It's a hard year, so far, and some things are slipping. I might get back in the groove soon, but for now, I have lost my groove. Any ideas on how to get it back? It's a new groove you're moving into; a new season of life. I can only imagine how tough that's gotta be. We are in our 17th year of homeschooling and have 12 to go (just started kindergarten with my baby). The best advice I have is to ease into it and give yourself room to accept the changes. I'm pinning this one. Thanks, Cheryl. It is a new season and I am finding it difficult to adjust. I know it sounds trite, but enjoy your next 12 years- they will fly by, but I'm sure you know that. I have not homeschooled nearly is long as you, but I have some of the same feelings you are having. My oldest, who had gone back to public school for high school, just went off to college. My youngest, who is still homeschooled and is a junior, has started taking some classes at community college. I still do some subjects with him, but he works mostly independently. I find I am sometimes adrift. I don't feel like I am accomplishing much even though there is plenty around here to do! I just can't always come up with what it is I should do. What I find works for me is my bullet journal (you can google it - I have simplified it even more). I first sit down and do a brain dump of everything I can possibly think of that needs to be done (I put the master list - one that can continue to be added to - at the back of my journal. I start with the last page and move forward. ), then I look at the list and see what I can (or want to) do that month. And in one of the front pages of my journal I write that list. Then I write my list for the next day from that list, but I refer to my monthly list to write each day's activities. If I don't complete an activity on a given day, it goes on my list for the next. I know this probably sounds ridiculous, but it really does help me focus on what needs to get done. And the best part is, I end my day with a feeling of accomplishment! And congrats on your many long years of homeschooling! Quite an accomplishment. Perfect description of how I feel! I did just tell my husband yesterday that I get much more done with a list, but sometimes I can't even think about a list. Off to google 'bullet journal'. Thanks for the encouragement.